BELIZE CITY, Mon. Feb. 1, 2016–Only 2 of the 3 scheduled games were played over the weekend in Week 2 of the Premier League of Belize (PLB) Closing Season 2015-2016. The official report has not arrived yet from the league secretariat, but reliable sources have Police United coming from behind to defeat the young upstarts, Wagiya, by a 4-2 margin at the Norman Broaster Stadium on Saturday night. 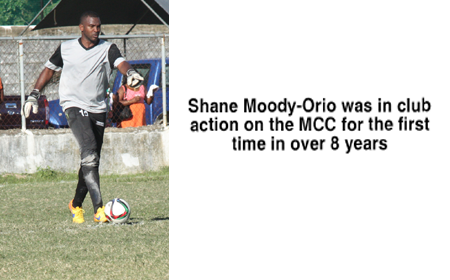 And at the MCC Grounds on Sunday afternoon, home standing BDF and visiting Belmopan Bandits, featuring Belize national team goalkeeper Shane Moody-Orio in goal, played to a 0-0 draw. The scheduled Saturday night game at the Michael Ashcroft Stadium between Placencia Assassins FC and Verdes FC did not take place, and will reportedly be played as a back match later. Verdes’ season opener against BDF FC last Sunday, January 24, was also postponed, so they now have 2 back matches pending. 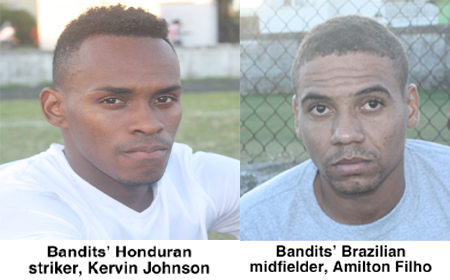 The defenses dominated Sunday’s game at the MCC, with one great header by Highking Roberts of the Bandits some 15 minutes into the game that saw a spectacular diving save by BDF keeper Tevin Gamboa. The tall and high leaping Roberts placed it perfectly to the bottom left corner near the post, but Gamboa saved the day for his team. On the other end, Shane was very much in command of his team, directing the defense and the attack in a very vocal manner, and was rewarded with very few dangerous threats from the BDF front line. Both teams were well matched, despite the Bandits showing some new foreign additions, Amilton Filho from Brazil and Kervin Johnson from Honduras, aside from Belizean international Shane Moody-Orio. BDF is sticking to a fully local line-up, and were a formidable opponent for the star studded Bandits yesterday. The above games are according to the PLB official season schedule. We await confirmation of a proposed Thursday night Verdes back match.